Good morning to you on this bright Monday morning! I'm still playing with adorable Cottage Cutz dies from the baby release at The Scrapping Cottage, and this sweet card is yet another of my favorite creations using them. 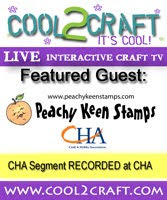 The patterned paper and card stock I used on this card come from The new Peachy Picks Kit from Peachy Keen Stamps. 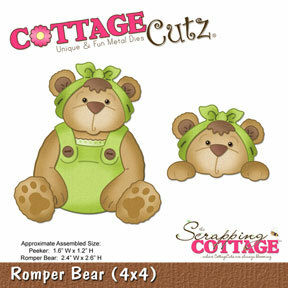 This card includes the following Cottage Cutz dies from the baby release at The Scrapping Cottage. This is one of my favorite dies from a previous release and I use it all the time. A MUST HAVE in my humble opinion! If you haven't dropped by The Scrapping Cottage to check out the Wedding Release and The Victorian Garden Release, then you're missing out! There are some fabulous new designs that our Cottage Cutz fans have been asking for, and fabulous is an understatement! Head over there today and check them out! 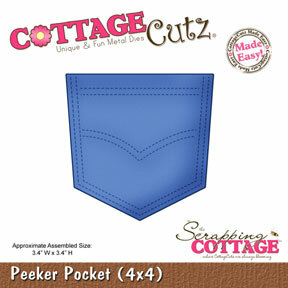 Lorie I love how you used the pocket and the duck from the diaper pin to fill the pocket! So cute!! 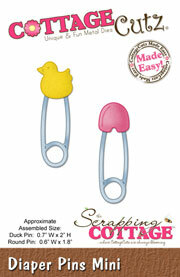 And pinning the diaper pin to the pocket was brilliant!